Graceful swimmers and fast runners, hippos graze during the night and spend most of the day in water to prevent their skin from drying out. Their eyes, ears and nostrils are positioned on top of the head so they can see, hear and smell when the rest of the body is submerged. Their reddish skin secretion acts as a sunscreen and may prevent any cuts and grazes from becoming infected in dirty water. 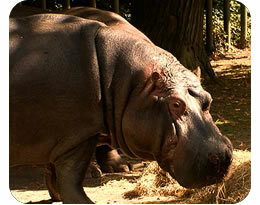 The word ‘hippopotamus’ is Greek for ‘river-horse’.